Porta-Fi was in Guangzhou to attend the Guangzhou HiFi Headphone & Digital Audio Expo 2017 on the 4th and 5th of November 2017 and was honoured to be invited to visit FiiO Electronics Technology Co., Ltd. which is based in Guangzhou, China on the 2nd and 3rd of November 2017. 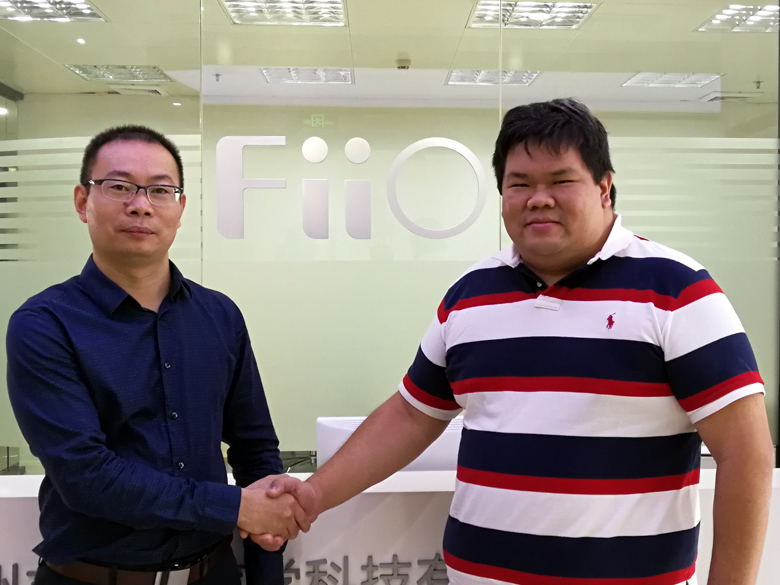 During our visit, we had the privilege of interviewing Mr Kean Zhang, Vice President of FiiO Electronics Technology Co., Ltd.
[BY] Mr Zhang, How are you? First, and foremost, thank you very much for finding time to accept this exclusive interview with Porta-Fi. This year being FiiO’s 10th year of establishment, how has the company’s vision and mission evolved over the past decade? [KZ] We have always adhered to establishing our own branding, backed by our own research and development model as the basis of our vision. In the last 10 years, we have also been guided by the mission of “enhancing the global influence of China manufactured products”. However, with the growth of FiiO and the changes to the global markets and economy, our vision in the medium and long-term remains dynamic. One of our vision in the next 3-5 years, for example, revolves around maintaining top 3 market share positioning in the global portable music player market. [BY] FiiO’s product line establishment has always been backed by your own teams in the area of research and development. In the past decade, what are some of the biggest challenges and failures if any? [KZ] FiiO as a company often face different challenges at different stages of development. Any company which maintains steady growth will almost always face the challenge of balancing the gap between resource allocation and development goals. This is, in fact, the only way we can continue to learn and progress. Our biggest challenge at this stage remains in the area of up-stream resource constraints where smartphone manufacturers have a stranglehold on the supply key components, leaving limited access for minority high-end products manufacturers like us. [BY] FiiO’s current flagship product line is the portable music players. Amongst the company’s other offering was also headphone amplifiers and digital audio converters. Last year, FiiO embarked actively in the development of earphones, can you provide us with some insights into the future outlook of this new product line? [KZ]FiiO will offer in-ear monitors in dynamic, balanced armature and hybrid configurations as well as headphones in both wired and wireless formats. We seek to lay our foundations in accordance with our thinking, progressively building up our product lines, eventually adding on capabilities such as active noise control (ANC) and wireless. FiiO has accumulated significant experience in the last decade, coupled with the core team’s working experience of more than 10 years prior to the establishment of FiiO. FiiO will have an advantage over traditional manufacturers when putting together wireless earphones combining acoustic, structural, software and wireless technologies. At the same time, we do not have the burden of legacy, allowing us to participate in the evolution of wired earphones to wireless comfortably. At this juncture, however, we remain focused on the development of wired earphones and seek to accumulate experience in technology management. [BY] In 2009, FiiO developed its 1st portable music player, the X3. Today, FiiO is No.2 globally in terms of market share. It would not be an easy journey, can you share with us the secret to FiiO’s success? [KZ] Hard work paves the way for the future, the process involves meticulous attention to details. In simple terms, strategic planning is essential when planning a new product line; rather than just introducing a product casually. Secondly, preparation. This includes understanding consumer needs through data mining, analysis and filtering; accumulation of technologies and realisation of product through development capabilities. Finally, sales and after-sales service. FiiO’s sales and after-sales service is recognised to be amongst the best in the industry and is one of the most comprehensive around. [BY] FiiO have always been a company who “designs, produces and sells high-quality products at favourable prices”, one of our readers wants to know if FiiO would abandon this to challenge the flagship products of other manufacturers, particularly in the area of portable music players? [KZ] The truth is, the so-called cost to performance proposition is a false one. The concept of price to value proposition is a more accurate depiction of our approach when considering price positioning. Our consideration includes the functions, configuration, sound as well as our ability to deliver a good product at the price and not simply lowering performance to achieve a lower price. This is evident whenever we offer an upgrade to each and every of our product line where features and performance have been upgraded but the price has relatively remained the same. As for the conjecture of challenging the flagship product of other manufacturers, one should be able to conclude from the operating model of FiiO. I have shared earlier that FiiO is a company with a sound system, and the business maintains a traditional model where we address market needs while maintaining normal margins to reward our partners, shareholders and employees. [BY] FiiO started its line of earphones in 2016 and have since released a few series, the F9 series has since gathered a lot of attention. FiiO announced last month, detailing improvements to F9 series, starting from the next batch of production. Few manufacturers would make improvements to a product especially given that the F9 series was launched last quarter. Why did FiiO make this decision? [KZ] Like any of our products, we are constantly improving the product to address inadequacies. In fact, these improvements are the result of feedback from consumers. Of course, these improvements do not alter the core functions of the product, it can only be said to be improvements towards making the product perfect. [BY] Portable music players and earphones needs to be tuned during the development process. Some manufacturers’ claims to have their own sound signature, does FiiO have a unique sound signature? [KZ] Sound is a very subjective as there is no specific standard for reference. In addition, we serve a global market, where individuals have different preferences when pairing products. While the portable music player plays an important role, it is not the key differentiator of sound. In general, FiiO products are relatively neutral in tuning with slight variations catering to the different target markets. [BY] You have always been involved in product development. Which is the product that you are most proud of? Why? [KZ] As the company grows, we are able to allocate more resources towards product development. This allowed for more failures in the development process contributing to the majority success of products that we undertake for development. The prominent products would be the E12/A5 amplifier series as well as the X5 MKIII portable music player. These products allowed me to understand that “if one undertakes efforts to fulfil the users’ actual and potential needs, one will achieve double returns”. The E12/A5 is probably the first portable amplifier in the industry to use high voltage batteries to power yet can be recharged using a 5-volt smart charger while the X5 MKIII is probably the first portable music player in the industry to adapt fast charging technology. [BY] FiiO will be announcing the FiiO Music iOS APP at the FiiO Autumn Launch Event on the 4th of November. The core team at FiiO is made of up individuals mostly with industrial and product background. Following the decision to develop the FiiO Music iOS APP, is there a change in strategy? Will there be an Android release? [KZ] The development of the APP falls back on our customer-centric approach. It is our belief that if we serve our customers well, there will be more business opportunities. Having developed the iOS APP, we will definitely have the Android release in the near future. The development of the APP for both platforms is in response from our customers, many users have feedback citing their liking for the built-in APP on the X7 series which catered for interactivity and functionality and wishes to extend these features on other devices. We also see the APP as a bridge with other FiiO products, allowing for interactivity and synchronization of settings and functions. [BY] Thank you, I look forward to seeing you tomorrow at the FiiO Autumn Launch Event.